For more than 1300 years of existence, The Bulgarian state has its glorious times. We select 10 fortresses that have what to tell you about these periods. The fortress was built throughout the ruling of Justinian I (ruled btw. 527-565) who had undertaken huge military buildings on the whole Balkan Peninsula and had created few fortification lines – around the capital of Constantinople, the Rhodope mountains, the Balkan mountains, and the Danube river. The fortification was built above a Thracian rock sanctuary from V millennium B.C. The self-governing ruler Momchil – the fortress is named after him – is Bulgarian who has been involved in the internecine war for the Byzantine throne. The empress Anna of Savoy honored him with the title Despot. He has been called Sebastocrator by the Emperor John VI Kantakouzenos and received the fortresses Podvis and St. Irina. Later Momchil conquered Ksanti Fortress and made it his residence. He had personally led the struggle against the Ottomans and won the battle at Abdera (now located in Greece). Momchil had been killed in 1345 during the battle of Peritheorion, at the Aegean Sea coast. 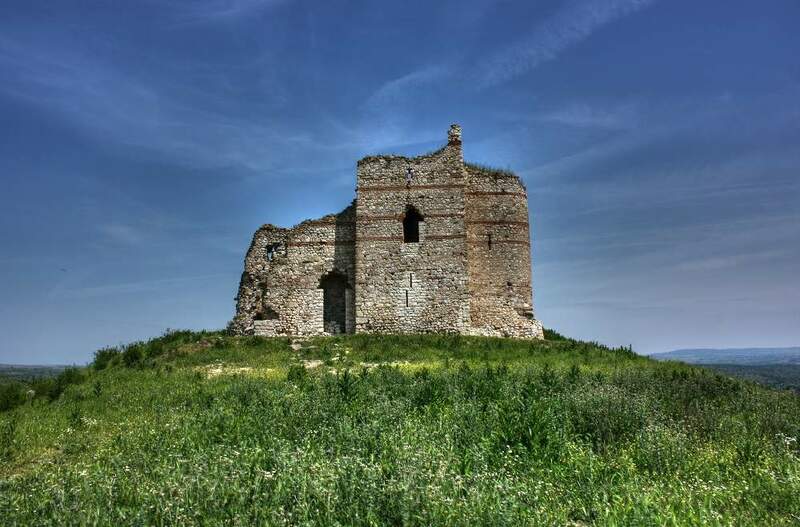 Bukelon (Matochina) Fortress is located nearby the Matochina village, Svilengrad. It lies on a high hill in the North part of the village. The stronghold was covering the whole ridge with its 150 m length and 60 m width. It form resembles a cross as its shorter side is orientated to the East, and longer one to the West. In 387 here was the great battle between the Emperor Valens and the Goths, which ended with a complete defeat of the Roman army and the death of the Emperor. At the same place in 1205 the King Kaloyan’s army defeated the crusaders, and took Baldwin I, Latin Emperor as a captive. The fortress is synonym of grandeur, glory, and wealth. It is a unique place where you can meet the past of Bulgaria and the history of its great rulers. The stronghold lies upon the homonymous hill in the Old part of Veliko Tarnovo, close to the town’s centre, and nowadays it is transformed into an architectural open-air museum. One of the biggest attractions there is the Sound and Light show. It narrates for the glorious and tragic story of the Second Bulgarian Kingdom (1185-1393). You can find the foundations of 470 buildings, an inn, aristocratic lodgings, 23 churches and 4 city monasteries at the Tsarevets’s territory. Unique pieces of gold-weave clothing as well as many golden adornments of the royal dynasty were found during the excavations. The fortification is an amazing act of nature, as well as the people. It is built amongst unscalable rocks, part of the Roman Empire then, long before the rise of the Bulgarian State. Just two of the fortress’s walls – the North-West and the South-East were built by human’s hand. The huge rocky massifs reached up to 100 m height and naturally completed the fortification. The Belogradchik rocks were amongst the competitors for the title of New 7 Wonders of the World. The fortress was used like a watch-tower at first, and later was extended, by the time of the Ottoman Empire. The fortress it the only fully preserved mediaeval castle in Bulgaria. The unique architecture is captured in the scenes of more than 50 Bulgarian and foreign movies. The castle exists more than 2000 years built upon the remains of the ancient fortress of Bologna. One of the legends for the fortification’s establishment tells that in the area had lived two sisters Vida and Kula – daughters of the eminent Boyar. Vida was amazingly beautiful and all men wanted her for a wife, but she didn’t like anyone. Kula often persuaded her sister to choose one, but Vida was inflexible. Soon they separated. Kula became a founder of the present town of Kula, and Vida stayed in the castle. When the Turks conquered Bulgarian lands, Vida was already old and solitary woman because in a lifetime couldn’t find worthy man of her own. When she found out that the Turks were coming, she ordered the building of towers where the people can hide. These towers are called Babani Vidini Kuli (Grandmother Vida’s Towers) in the present day.